Floyd has been visiting Blue Spring State Park since he was a calf. He usually arrives with the beginning of cool weather and heads out for the summer sometime in February or early March, and he is known to make several visits to the park each season. Floyd was born sometime during the summer of 1978. We know how old he is because when he was just a few months old, his mother Phoebe brought him to visit Blue Spring State Park in Orange City, Florida. The mother and calf pair also spent the cold months in the warm spring waters at Blue Spring, and Floyd has returned to the park every winter since that time. Phoebe died some years ago, but Floyd has a younger brother named Philip who also visits Blue Spring in the winter. Floyd is easily identified by the park rangers because he only has half of his tail as well as a large, crescent-shaped indentation and series of horizontal scars on his left side. All of these scars were caused by boat strikes. Manatees can swim up to 20 miles per hour in short bursts, but they usually only swim about three to five miles per hour. Because manatees are slow-moving, need to surface to breathe air, and prefer shallow water, they are vulnerable to boat hits. Floyd is known as a pretty reliable guy. He usually arrives at Blue Spring with the beginning of cool weather and heads out for the summer sometime in February or early March, and he makes several visits to the park each season. 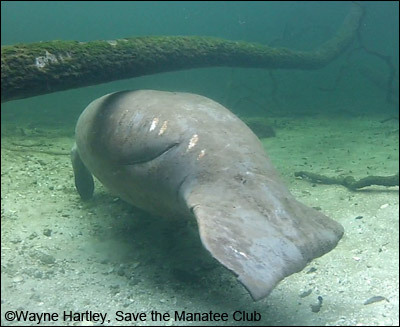 Wayne Hartley, Save the Manatee Club’s Manatee Specialist, has observed that Floyd has an interesting quirk that sets him apart from the other manatees. Apparently, Floyd likes to rest slightly away from the other manatees in the spring run with his head pointing downstream. Other manatees tend to face upstream into the current when they rest. Floyd is easily identified by the park rangers because he only has half of his tail as well as a large, crescent-shaped indentation and series of horizontal scars on his left side. All of these scars were caused by boat strikes. However, just because he rests apart from the other manatees does not mean that Floyd is anti-social. In fact, Floyd has a reputation for being playful and active, and he is often seen chasing after female manatees such as Phyllis, Lily, and Lucille. His male companions include Howie, Brutus, and Doc. Floyd showed up with fellow adoptee Gator on November 18, 2018, and he made over 20 visits to the park during 2018 – 2019 manatee season. In fact, on January 7th, he was the only Save the Manatee Club adoptee present for “manatee roll call” or the morning manatee count done by Wayne and Cora Berchem, Save the Manatee Club’s Manatee Research & Multimedia Specialist. On February 5th, Floyd made a visit to the park, along with Una and Annie and her calf. On February 7th and 8th, he was the only adoptee in again. Warm temperatures in February and March meant that February 8th was Floyd’s last visit for the season where he was, again, the only adoptee among the 50 manatees counted that day. 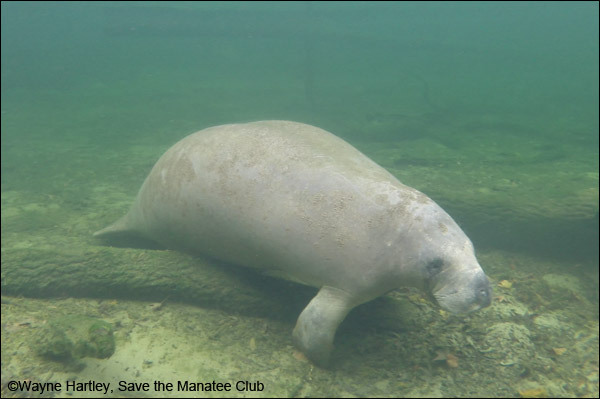 Be sure to check our Blue Spring webcams and get Wayne’s Manatee Updates for the latest news on Floyd and other Blue Spring manatees, and click the “Learn More” box to see scar charts for Floyd and the other Blue Spring manatees. Plus, see video of Floyd below and check out our YouTube page for additional videos. You can also adopt Floyd or other manatees. For more information, go to Save the Manatee Club’s Adopt-A-Manatee page, or call 1-800-432-JOIN (5646). Watch video of Floyd, as he swims, rests, and surfaces to breathe on his visits to Blue Spring State Park. Notice the unique scars that identify him.